Woo hoo! Thank you, Susan! What a nice Sunday surprise. :) You made my day! You're welcome. I think you'll be delighted with this book. Thanks for stopping by and congratulating Karen. Congratulations to Karen. Deanne Gist is one of my FAVORITE authors. Love her books. 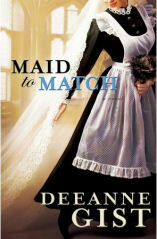 This was the first book by Deanne Gist I read. I'll be picking up more in the future. Thanks for stopping by and commenting. I've been struggling with my schedule since I started the new job.